Why did the number of homes let at social rents fall by 150,000 in the last five years? Surprisingly, although right to buy was a big factor, it wasn’t the biggest. From April 2012 until the same month in 2017, right to buy led to 55,000 council houses sales and 20,000 by housing associations (the latter is because of the ‘preserved’ right to buy kept by tenants if their homes are transferred to a new landlord). So half the net loss can be explained by such sales. But there were two much bigger factors behind this recent assessment by the Chartered Institute of Housing of the losses in social rented stock. First, new build would easily have offset right to buy sales if output of social rented homes had continued at the same rate as in the previous four years: from 2008/09-2011/12, thanks to the investment made under Labour’s National Affordable Housing Programme (NAHP), 142,000 social rented homes were built, over 35,000 per year. Had this continued, social landlords would have built two new homes at social rent for every one sold, even after right to buy was ‘reinvigorated’ with bigger discounts from April 2012. As it is, the Tories are clearly poised to fail in their much more limited promise to replace the extra houses sold as a result of the right to buy being ‘reinvigorated’, and of course the replacements are all likely to be let at higher, ‘affordable’ rents. Nevertheless, some new homes are being built for social rent. Adding together new homes built by housing associations and by local authorities, these total just over 50,000 over the five years. Not only is this far lower than achieved under Labour’s NAHP but numbers are now down to only 5,000 per year, with little prospect of their being revived. So in mathematical terms the biggest reason for the loss of social rented homes is failure to build: if Labour had still been in power, continuing a similar programme to its NAHP, around 125,000 more social rented homes would have been built than has been achieved by the coalition/Tory governments. Source: HCA, Private registered provider social housing stock in England 2016-2017. So selling off the stock wasn’t the biggest reason for the loss of social rented homes, it was the failure to build. Oddly enough, right to buy wasn’t even the second biggest reason. The candidate for this status can be seen in the graph. From 2011 onwards, the coalition government set out to make a heavy dent in the provision of social rented housing in two ways. First, as we have seen, it built homes for ‘affordable’ rent instead of social rent, constructing about 90,000 up to April 2017. 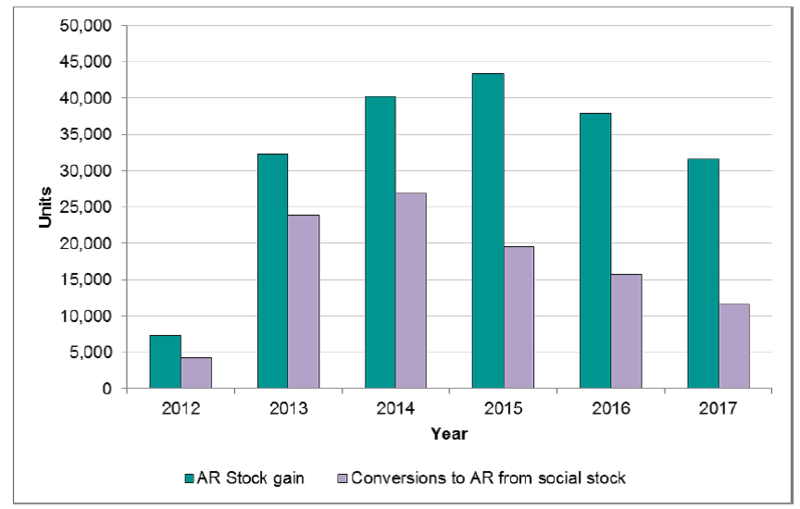 But second, it converted homes from social rent to ‘affordable’ rent at an even faster pace, with 102,000 conversions in total by the same date (shown purple in the graph, the green columns show the total AR stock from conversions plus new build). It forced associations to do this to give them extra rental income, to offset the loss of government grant (it fell from around £60,000 per new home built under Labour to less than £20,000 under the Tories). This is therefore easily the second most important factor in the decline of social rent. Right to buy, whether for councils or housing association properties, is therefore the third biggest factor. But even this isn’t the whole story: both councils and housing associations have been demolishing social rented stock (for example, in regeneration schemes), and these losses run at around 4,000 per year. In addition to these recent attacks on the social rented stock, it faces two more potential dangers: the new right to buy for housing association tenants, and the enforced sales of ‘high value’ council properties. At the moment, the first of these is only going ahead as a pilot scheme in the West Midlands, and will be funded by government. But the prospect of enforced sales of council houses, now less likely after the Grenfell Tower disaster, is still ‘on the books’ and is inhibiting many councils from taking on more ambitious investment plans. If right to buy for association tenants were to go ahead across the country, someone would have to fund the discounts and at the moment the only money potentially available is from forcing councils to sell off their better stock. In this situation, Labour’s priorities should be clear: not only does it need an even more ambitious new build programme than it had when it was last in power, but this needs to focus strongly on building for social rent, as John Healey has promised. And the haemorrhaging of the existing stock must be halted too. This will mean, first, either suspending council tenants’ right to buy or at the very least making the discounts they receive much less attractive; second, rescinding the promise to housing association tenants that they can buy their homes and calling off ‘high value’ council sales; third, ending the conversion of properties to higher rents and, finally, ensuring that any regeneration schemes provide for at least one-for-one replacement of any social rented homes that are to be demolished. Another reason behind the fall in social housing numbers was the sale of properties, particularly high value properties in London by housing assiciations. The HCA, now Homes England, introduced and change in their regations enabling associations to sell properties without their permission a d with consulting with the local authority. Since then some associations have gone to town and sold large numbers of properties. Of course we don’t know the numbers.